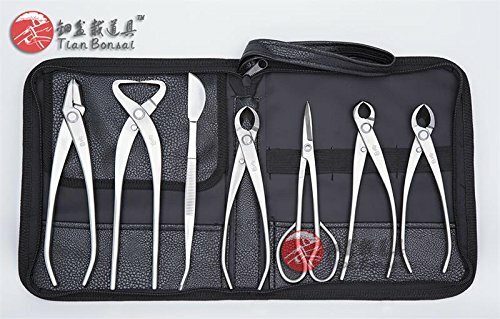 Including Jin Plier (8"), Trunk Splitter (8"), Long Handle Scissors (7"), Branch Cutter (6.5"), Knob Cutter (7"), Round Edge Cutter (7") & Bonsai Tweezers (8"). Except the bonsai tweezers was made by the 3Cr13 stainless steel, other's part in this tool set were made by the 5Cr15MoV stainless steel. their blade's hardness is about HRC58. Quality: master's grade, handmade by the master worker from TianBonsai, have the best quality in our tools. Quality Assurance: 3 Years, in normal use, if the tools have any problem, we will resending a new one to you without any fee, you just need to take a photo to us to show the problem. TianBonsai Co. Ltd. is a professional manufacturing company focusing on the creation of high quality bonsai tools. Our production facility is located in China. At TianBonsai we have the foremost trained craftsmen with a complete production line. Many years of experience have taught us how to make the best quality bonsai tools. We are the original equipment manufacturer (OEM) for many famous brand bonsai tool companies. Besides the TianBonsai brand, we own Mu-Tian and Beginner Series brand. Since June 2013, we have established our own online stores at eBay, Amazon and Aliexpress. We now have acquired the trust of many bonsai enthusiasts around the world. Carrying on the management philosophy that the customer comes first, TianBonsai continues to improve the logistics of distribution and after-purchase customer service. We constantly consider your wishes so you have the best consumer experience possible. Our commitment is to bring to you the most reliable, durable and finest products achievable. We hope that our products increase your enjoyment of bonsai and together we can advance this ancient, elegant art. Except the bonsai tweezers was made by the 3Cr13 stainless steel, other's part in this tool set were made by the 5Cr15MoV stainless steel. their blade's hardness is about HRC58. If you have any questions about this product by Master Grade Bonsai Tool Kit, contact us by completing and submitting the form below. If you are looking for a specif part number, please include it with your message.